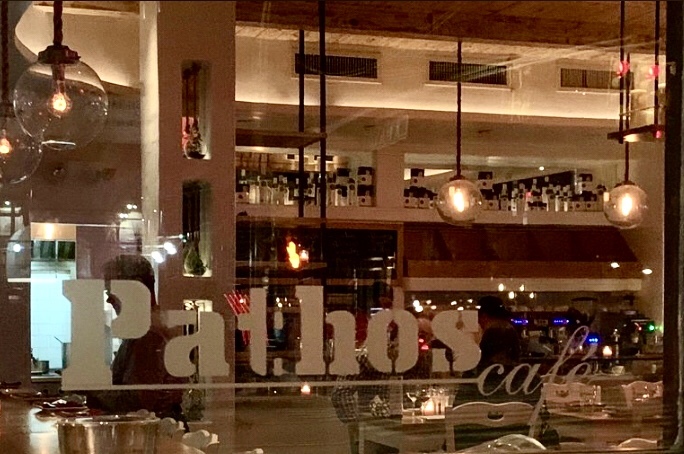 When I recently met a friend for a drink at the establishment pictured above (on 1st Avenue), it occurred to me that Pathos was an odd choice for the name of a cafe. (Although, come to think of it, there is a “Tea and Sympathy” in New York’s West Village, which carries its own quality of pathos.) I asked the owner of Cafe Pathos what was behind its name, and she answered with a broad smile: “Why, it’s the Greek word for ‘passion’!” But is it the same kind of passion we know think of when we hear that word today? First, let’s look at the English words pathos and bathos — words that are often confused with each other. Bathos: rhetoric. “Ludicrous descent from the elevated to the commonplace in writing or speech; anticlimax.” Mid 17th century (first recorded in the Greek sense): from the Greek word bathos meaning literally ‘depth’. The current sense was introduced by Alexander Pope in the early 18th century. Pathos: “A quality which evokes pity, sadness, or tenderness; the power of exciting pity; affecting character or influence.” Mid 17th century: from the Greek word pathos meaning ‘suffering’; related to paskhein ‘suffer’ and penthos ‘grief’. But let’s go back to the word passion. It dates back originally to the late 12th century, when it meant “sufferings of Christ on the Cross” (hence the Passion Play, the Passion of Christ – and no, that doesn’t refer to his feelings towards Mary Magdalene). It comes from the late Latin passionem, meaning “suffering, enduring.” Its sense extended by the early 13th century to the sufferings of martyrs and suffering generally; by the 14th century it suggested “strong emotion, desire” — and that’s when it connected (through the late Latin passio) with the Greek pathos. Ah: there it is. The connection between pathos and passion.